Some very excellent news! Here we see a political action in service of the health of both people and our environment. And what a perfect place to do it: the hometown of Henry David Thoreau. Thank you, Concord, Mass, for carrying on his legacy of visionary activism. This action will mean less plastic building up the Pacific Garbage Patch, an island of garbage floating in the sea; cleaner groundwater in Massachusetts’ landfills, and healthier people who won’t be drinking water out of these as much, or breathing air polluted by manufacturing and transport of these unnecessary plastic bottles. For a link to a Huffington Post article that provides more details, click the picture (the admirable work of missionpraxis). Manufacturers of reuseable bottles, now is your chance! Sales will be increasing. Please make your wares sturdy, non-toxic, and beautiful. It’s nice to own such possessions worthy of long-term respect, instead of those intended from their birth for thoughtless insto-disposal. Ah, it’s a good day. As I had just moved to the area when the call came out, upon reading my proposal, Dr. Burggraf and committee allowed me to waive the requirement of co-authorship with a community partner. I was grateful to be able to participate anyway – and I dearly wish to have such partners in future. Fast forward to May: last week, the authors presented our final papers as a panel. Anne Parker & Mark Wilding illustrated ways to engage adolescents and young adults in “Transformative Learning and Sustainability.” Sherry Ellms & Leila Bruno described how the Awakening the Dreamer, Changing the Dream symposium is “Nurturing a Culture of Possibilities.” With each encounter at Naropa, I feel even more impressed by the depth of my new colleagues’ wisdom and heartful caring for the world. 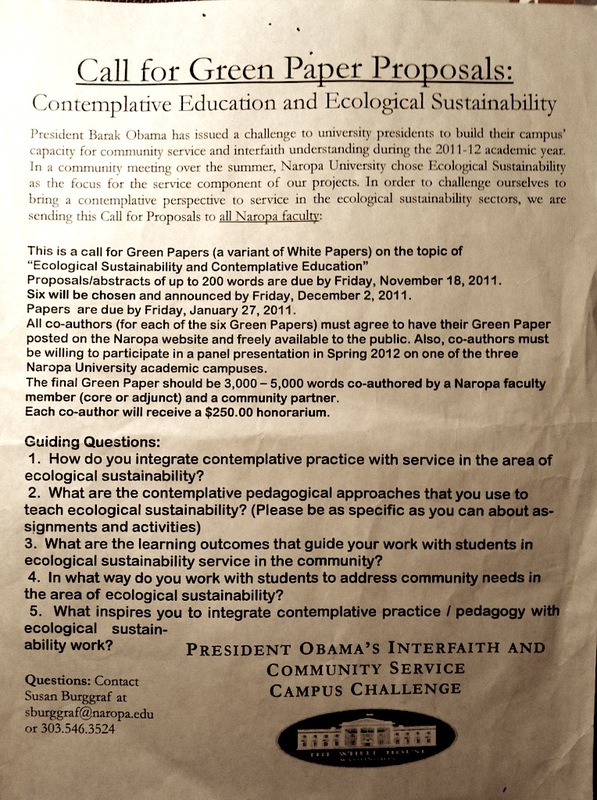 The Green Papers will be made available on Naropa University’s website sometime later this summer, but my students have graciously asked to read mine now. So here it is, out in the world already like an early crocus peeking through the snow. As the Spring semester is winding down and they find themselves without any formal reading assignments, the void looms. 😉 I hope you enjoy this paper, or that it at least helps fend off any grad school withdrawal symptoms. by Tina R. Fields, Ph.D. If you’re wondering what you’d be getting into, here’s the trailer. The paper itself is much more fun to read than the Abstract. It centers on a story! Abstract: This paper describes a college assignment intended to foster ecoliteracy in social science students. The inclusion of a contemplative component conducted over time outdoors has repeatedly resulted in not only cognitive knowledge about the denizens and processes of a given place, but has transformed students’ relationships with the more-than-human natural world to a much deeper relational gnosis and comfort level. Excerpts from one inner-city student’s journal are presented (with permission) as a case study, and elements contributing to the assignment are discussed. Feel free to engage with me via the “Comments” box below. I look forward to hearing your responses to this work. A deep bow to Naropa University for choosing this paper, and to former colleagues/forever friends Nicky Duenkel and Judy Pratt for generously giving me feedback for improving it. The League of Conservation Voters has come out with this year’s (2011) stats on our elected officials’ work. It specifically focuses on their choices affecting the health of the planetary systems that sustain our lives. Read their Scorecard, then keep the info firmly in mind when deciding whom to hire again come next election. As a voter, I think it’s time to clean House.